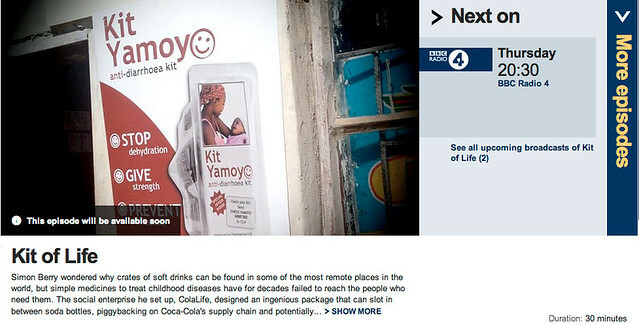 ColaLife’s Kit Yamoyo won Product Design of the Year 2013 and it was at the award ceremony that I first met Peter Day, the BBC’s Global Business Correspondent. The next time I met him was a month or so later in Zambia when we travelled together, way off the beaten track to one of the target communities of the ColaLife trial – a village called Kanchele. This programme is the result and it will be broadcast on Thursday, 29/8/13 at 19:30 GMT (20:30 BST) on BBC Radio 4 and you can listen to it online here. I haven’t heard the programme but I guess it will take you from the concrete and glass glitz of the award ceremony in London to the ColaLife front line in rural Zambia with a few surprises on the way. We are very pleased that Peter Day will chair the Q&A Session after the UK Premier of the ColaLife Documentary – The Cola Road – on 23 Sept 2013 at the RSA in London.